You see, to date, Android Auto's interface has had five tabs - telephony, navigation, media, home, and the mysterious "OEM" tab, which has an icon that looks like a vehicle gauge. Until now, that fifth tab didn't do anything aside from provide an exit out to the vehicle's normal infotainment interface. Google never went out of its way to elaborate what the tab would be for, and I have hounded manufacturers of various Android Auto-equipped vehicles from day one about what the plans for this area were. I repeatedly got nothing. The fifth tab is now alive. Well, sort of: concepts of what the fifth tab could look like were demoed at I/O 2016 by Honda and Hyundai, finally making use of that mysterious little piece of real estate I had previously discounted as something of a failure to launch. 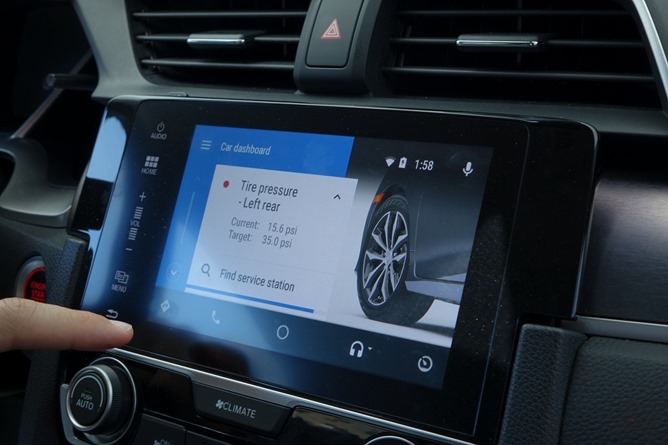 Hyundai is demonstrating integration of its BlueLink suite of services and vehicle diagnostics at I/O (like gas mileage, braking habits, error code definitions), while Honda is showing how basic vehicle statuses like tire pressure and oil change intervals could be monitored. Let me be clear: neither of these things are actually very exciting in and of themselves. Like, at all. Your car's existing head unit or a connected app can already tell you this stuff if Android Auto can. While it might serve to add some convenience and lessen clutter in accessing it, it's not a feature that's going to hand the projected car mode crown to Google and send Apple CarPlay packing. It's just not that big a deal, at least not yet. What is a big deal is that car manufacturers are actually letting vehicle data be piped into the Android Auto app, albeit in a very limited and highly restricted fashion. Both Honda and Hyundai retain complete custody of any vehicle data shown in Android Auto, and that data is only available to the apps Honda and Hyundai will publish (presumably, on the Play Store) to access it. And even if the data were technically accessible to other apps in Auto, Google holds all the keys to the larger Android Auto castle - I have yet to see anyone successfully "hack" an app into projected mode on Auto that isn't explicitly supported, and Google individually certifies and whitelists any app that has an Auto mode. For now, only media playback apps are even allowed from third party developers on Auto, and they must use Google's strictly-defined app layout. There is essentially no freedom in designing your app to work for Auto. Android Auto isn't an operating system, though, so the restrictions have the excuse of being about protecting a single Google app's experience, not a larger platform. This tight control is no doubt a big part of the reason OEMs like Honda and Hyundai are extending their own applications into the Auto experience - they trust that Google won't let that vehicle data be tapped into by third parties, and likely not even by Google itself. It lets carmakers corner the vehicle data experience on Auto in the way they and Google agree to present it, and carmakers are all about control of their products. And while the products of this work aren't earth-shattering yet, they could be a sign of increased cooperation between carmakers and Google - Android Auto is the olive branch that says "listen, we get it: vehicle data is sensitive, and control of the user experience is important." It's the reassurance that increasingly technologically cornered traditional automakers are likely seeking. The tech industry and consumers at large are demanding car companies get with the program, or customers will move on to more forward-looking brands like Tesla. And what could such continued cooperation entail? 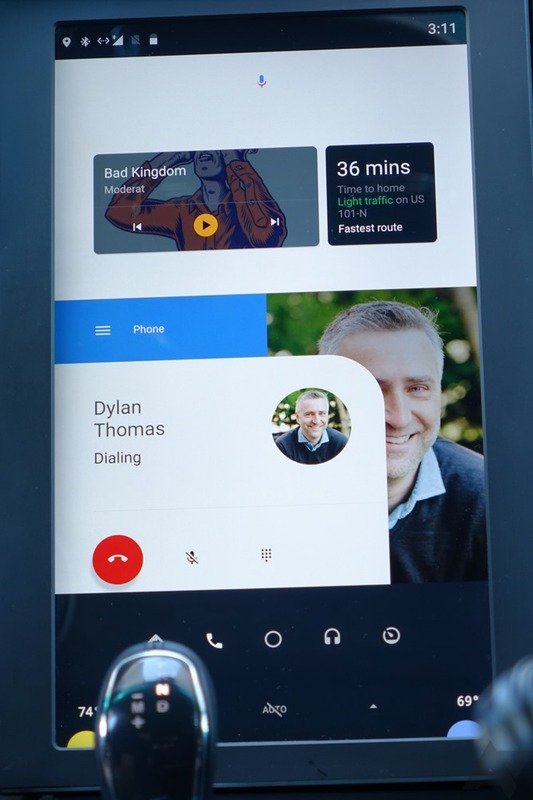 I think Google made that crystal clear at I/O: full-on Android in the car. In partnership with Qualcomm (Maserati was not involved, Qualcomm just bought a Maserati), Google showed us what an Android Car OS would look like, built from the ground up for a vehicular experience. And Android N is the first version of Android to include, as part of AOSP, core vehicle functions that automakers can use to more easily put Android on their vehicles without hacking it into a million pieces. Google's ambitions of full Android in the car are grand, and even a bit farfetched - you'll get no argument from me. The automotive industry is notoriously slow to move, vehicle product pipelines are insanely long (often 6+ years for a brand new car), and manufacturers are obsessed with controlling the branding and experience of their products. So, perhaps Google's Android and traditional cars won't ever be a good fit, and Auto will just remain Google's primary foot in the door of your vehicle. But maybe the time is right for carmakers to ask if, like phonemakers before them, Google's apps and services bring enough to the table to give Android a shot.